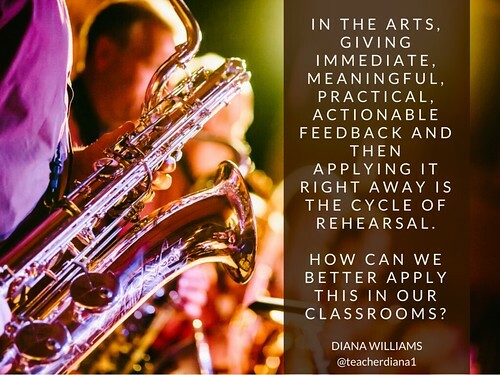 One of my best buds is a brilliant Canadian elementary school teacher named Diana Williams. She’s this super motivated, talented woman who finds great ideas and then runs with them — challenging both her own practice and the practice of others along the way. Diana’s right, isn’t she? There ARE places in our schools where high-quality feedback is the norm rather than the exception to the rule. In my own training I had this immediate feedback/application cycle and the thinking skills that are inherit in that process/feedback modeled for and with me and practiced until it became unconscious muscle memory. That’s true for your softball coach too, guys. And for your carpentry teacher and your auto mechanics instructor, your drama director, your family and consumer science teacher, and your dance instructor. They are all highly trained experts with first-hand experience with the kind of feedback/application cycle that Diana describes. That also means every experience that your students have had in classes beyond the core curriculum has probably been FULL of examples of high quality feedback. They’ve already learned to set goals and measure their progress against examples of excellence. They’ve already started identifying areas of personal strength and weakness — and they’ve already felt the satisfaction that comes from discovering that forward progress IS possible. The simple truth is that learning to receive and react to feedback — a skill that has natural connections to classes outside of the “core” curriculum — may be the most important academic skill that students ever learn.